If you purchased and then returned a Motorola XOOM WiFi any time between March and October of 2011, there is a chance that your unit was not fully refurbished properly and then sold again between October and December 2011 on Woot.com. That means that some of your personal information including pictures, documents, usernames or passwords could have been left on your returned device and then sold again to someone as a refurbished unit. Motorola released a statement moments ago to address the situation. They are offering potentially affected customers a free 2-year Experian ProtectMyID Alert subscription just to be safe. So if you returned a WiFi XOOM to Amazon.com, Best Buy, BJ’s Wholesale, eBay, Office Max, Radio Shack, Sam’s Club, or Staples during that March to October stretch, you will need to contact Experian to get setup with this service. LIBERTYVILLE, Ill. – Feb. 3, 2012 – Motorola Mobility, Inc. today announced that it has recently learned that approximately 100 out of a batch of 6,200 Motorola XOOM™ Wi-Fi tablets that were refurbished by Motorola Mobility may not have been completely cleared of the original owner’s data prior to resale. The affected tablets were resold by Woot.com between October and December 2011. While this matter likely affects only a small number of refurbished units, Motorola has a strong commitment to its consumers, and is proactively responding to mitigate any risk to its customers. Motorola has confirmed that any refurbished units sold outside the time period in question were properly refurbished. The information that may be accessible to the purchasers of the impacted refurbished tablets may include any information that the original user elected to store on the tablet. It is possible that users might have stored photographs and documents. They may have also stored user names and passwords for email and social media accounts, as well as other password-protected sites and applications. In conjunction with today’s announcement, Motorola is also actively pursuing the return of the impacted refurbished units to ensure that the memory of each device is cleared. 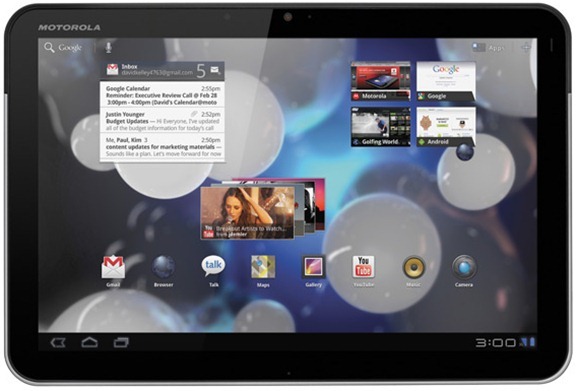 Customers who purchased a refurbished Motorola XOOM Wi-Fi tablet from Woot.com between October and December 2011 are encouraged to visit motorola.com/xoomreturn or to call Motorola Mobility Customer Support at 1-800-734-5870, select Option 1, in order to determine if their tablet is affected. Motorola sincerely regrets and apologizes for any inconvenience this situation has caused the affected customers. Motorola is committed to rigorous data protection practices in order to protect its customers, and will continue to take the necessary steps to achieve this objective.